Liquid eyeliners and pencil liners are fine but a lot of times but more times than not I find myself looking around my makeup table for a smudge brush to soften the look, especially for a daytime look. This JANE IREDALE Mystikol Powdered Eyeliner/Highlighter ($20 @ nordstrom.com) is a nice one to not only apply color but virtually eliminates the second step of blending it in. Beautyfix Is Calling All Beauty Junkies! What It Is: A way to sample some of the hottest up and coming brands. How It Works: For $50/quarter or season, you receive 8 products (mostly full sizes and a few deluxe sizes) delivered right to your door. And you can stop, start or put your account on hold anytime you want. KRONOS 'Phyx' Overnight Repair Maskque (4oz) - can't wait to try this one! This was my first sampling of JANE IREDALE Mineral Cosmetics. I had never used a pressed version of minerals before and was very impressed with the formula of PurePressed Base ($48). 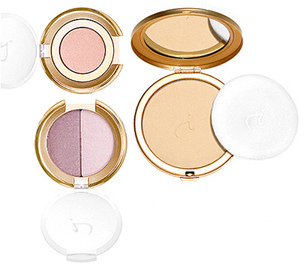 This is a foundation, powder, concealer and sunscreen all in one pretty gold compact. Titanium dioxide and zinc oxide act as anti-inflammatories as well as broad-spectrum sunscreens (SPF 18). There are no oils, talc, dyes or synthetic preservatives in her products. The color choices come in four categories: Cool, Neutral, Warm and Global. I found the foundation gave me good, smooth coverage with only a small amount of product.